on this weekend: 4 & 5 August 2018. SATURDAY 4 August 2018. Venue: Ravindra Natya Mandir, PL Deshpande Auditorium, Near Siddhivinayak Temple, Sayani road, Prabhadevi, Mumbai, 400025 ( #Dadar ). SATURDAY 4 August 2018. Venue: Thorale Bajirao Peshve Sabhagriha, Above college Canteen, VPM's Thane college campus, Near Cidco Bus Stop, Chendani #Thane West. SUNDAY 5 August 2018. Venue: Sahitya Mandir, Plot # 26, #Vashi, Navi Mumbai - 400703, Sector 6, Near Sacred heart High School. SUNDAY 5 August 2018. Venue: CKP Hall, Tejpal Scheme Rd 4, Vishnu Prasad Society, Navpada, Vile Parle East, Mumbai, Maharashtra 400057. 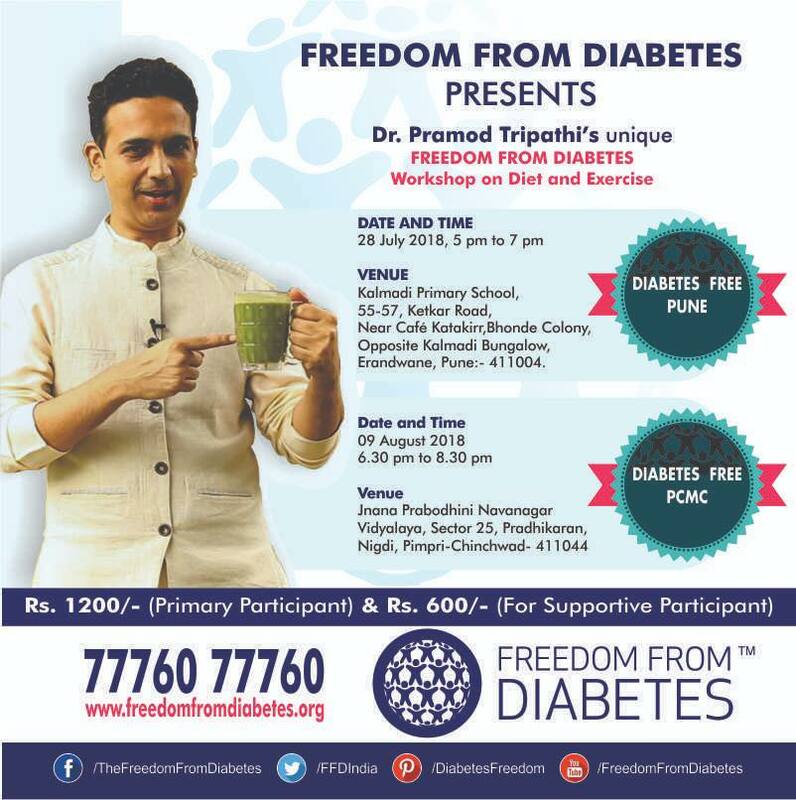 Charges: Rs 1200/- for Diabetic/ Primary Participant. Rs 600/- for accompanying IMMEDIATE family member. A proven, scientifically researched, holistic approach to better health. 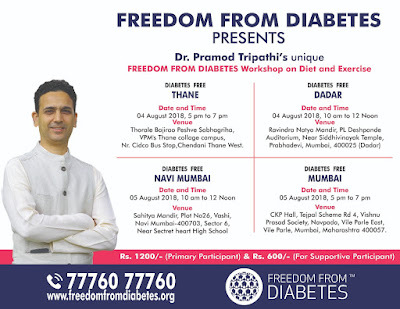 6000+ Diabetics already Free from Medicine & Insulin. Also helps to reduce weight, reduce or stop cholesterol, hypertension, thyroid medications, stress management & improve overall fitness and well-being. 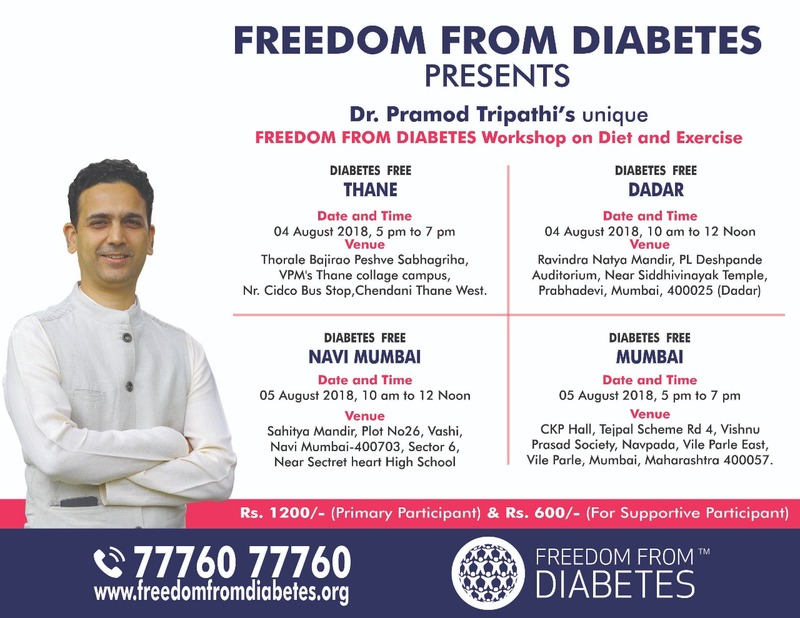 63 DIABETICS are FREE from INSULIN/ MEDICINES in LESS THAN 8 WEEKS! Group Freedom Story- Intensive Batch # 40- 2nd Group Session. Here, in Intensive Batch # 40, Forty diabetics are on stage who became free from insulin and medicines are sharing their transformational experience. • Intensive Program is a highly evolved change management program with PERSONAL ATTENTION and GROUP THERAPY. 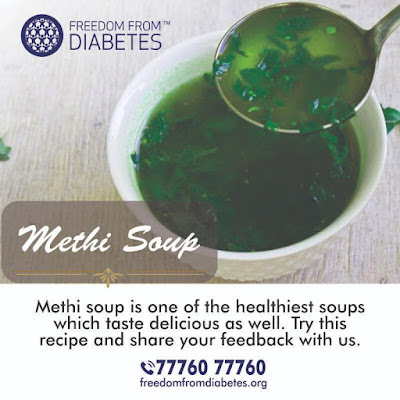 It has helped diabetics to achieve miraculous results. Boil dal with 2 cups of water, turmeric and salt for two whistles, first on high and second on medium flame. In a pan, add oil and once it is hot, add jeera and fry till it turns brown, add garlic. Once garlic becomes brown, add onion and chillies. Fry till golden brown. Add in all the masalas, mix on a low flame. 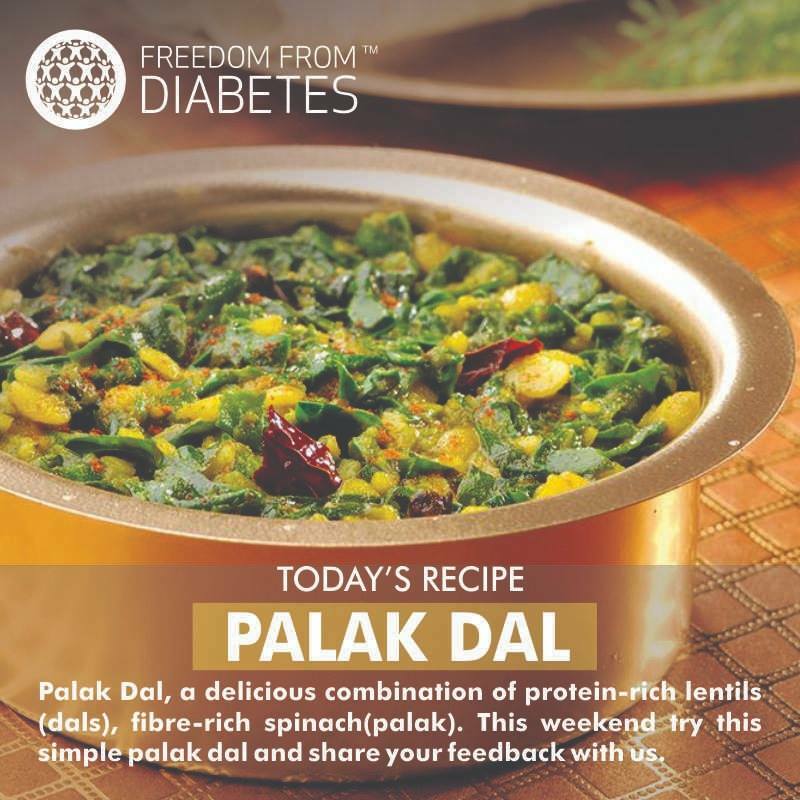 Add palak and tomatoes. Palak will leave some water so let it get cooked for 5 mins on a medium flame. Add in the dal, ginger, mix and boil for 4 mins on a low flame. 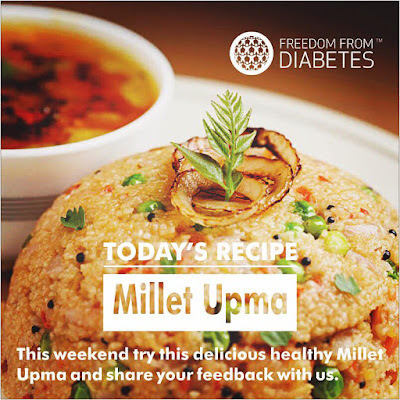 Have you ever tried upma with Millet? This weekend try this healthy upma and share your feedback with us. Method:Roast the white udad dal to a golden brown. Add the mustard seeds, jeera and roast till it sputters. Quickly add green chillies, ginger and the curry leaves. Now add asafoetida and then the roasted millet semolina. Roast it on a low flame for a couple of minutes. Put the peas, carrots and onions and salt. Put 2 cups of water and pressure cook to 3 whistles. Take it out on a serving bowl and garnish with coriander and lemons. You can add any vegetables like spinach and other greens. Do you know all the benefits of drinking green tea? Dr. Eric Berg talks about the benefit of drinking green tea! Green and black tea comes from the same exact plant. Black tea is more fermented and green tea is not. Green tea has phytochemicals, plant based chemicals that give unique health properties that go beyond vitamins and minerals. Barley is known as “King of Cereals”. It is loaded with essential nutrients. It is full of fibre, vitamins, minerals, and antioxidants. Name of Barley in other languages: Jau (Hindi), Juvar/Cheno (Gujarati), Barli Arisi (Tamil), Barli Biyyam (Telugu), Shaeir (Arabic), Cebada (Spanish), Cevada (Portuguese), and Orge (French). 1. It also helps to stabilize your blood pressure as it is rich source of potassium.2. Helps in Losing Weight: It is packed with essential vitamins and minerals. It is also rich in fibre and very low in fat. 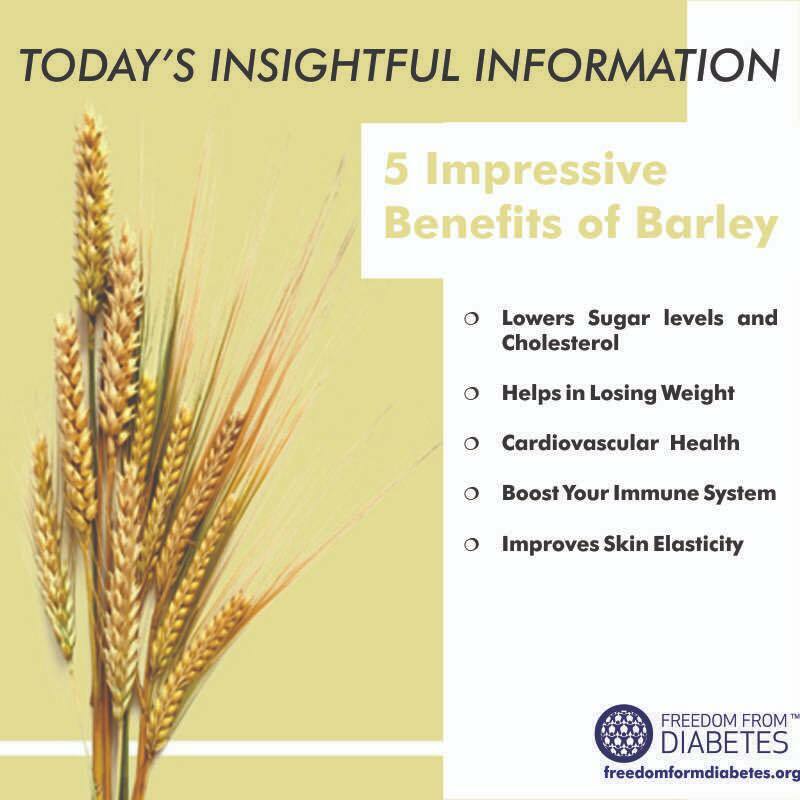 These properties make barley an ideal weight loss agent.3. Cardiovascular Health: Barley is known to reduce blood pressure and a lower cholesterol level hence is good for cardiac patients.4. 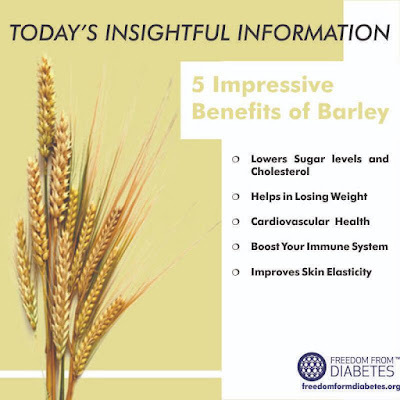 Boost Your Immune System: Barley contains beta-glucan, a type of fibre that is rich in antioxidants which is known to boost the immune system.5. Improves Skin Elasticity: The presence of large amounts of selenium helps in maintaining the elasticity of the skin, keep it toned, and prevent free radical damage. WHEN? Saturday 28 July. Time: 2 pm to 6 pm. 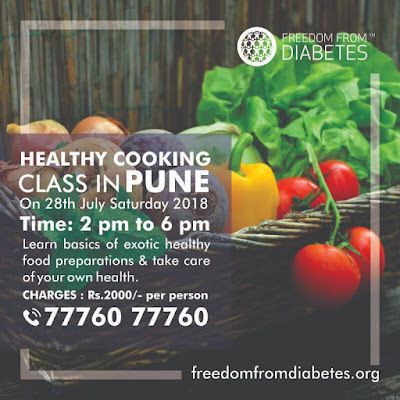 Learn basics of exotic healthy food preparations & take care of your own health. A cooking expert will teach over 20+ dishes in a matter of four hours and discuss 50+ variations of Chutneys, Salads, Breakfast items, Meal items, Healthy snacks, etc. A-13, Westend village, 101 Paud Road Right Bhusari Colony, KOTHRUD, PUNE - 411 038. Fees: ₹ 2000/- per person. 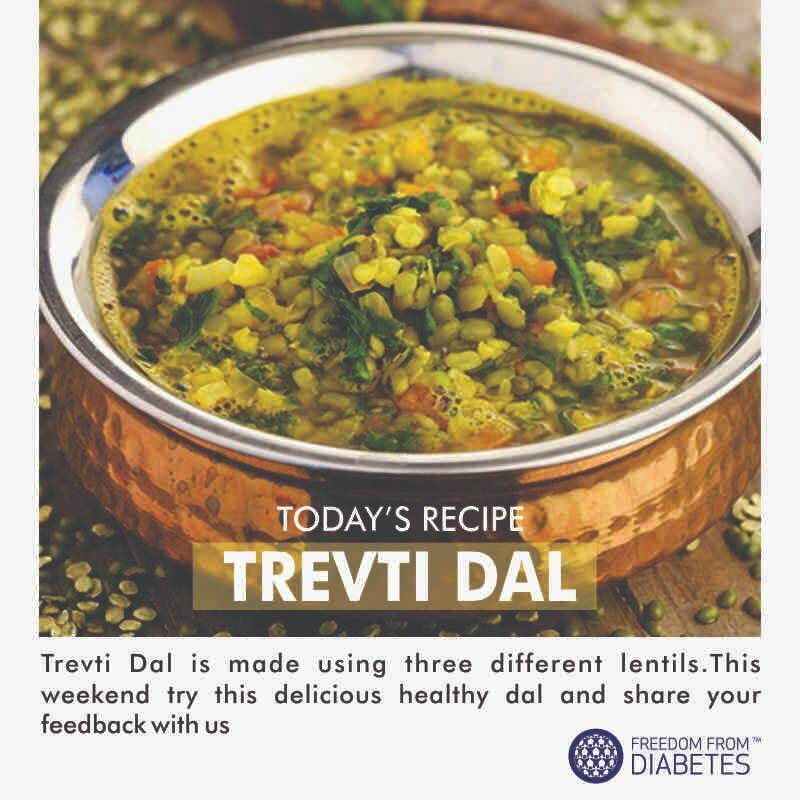 RECIPE: Trevti Dal - त्रैवती दाल! Wash the dals, add 1½ cups of water and pressure cook for 3 whistles. Allow the steam to escape before opening the lid. Keep aside. Heat the oil in a deep non-stick pan and add the cumin seeds, cloves, bay leaf, red chillies and asafoetida. When the seeds crackle, add the ginger-green chilli paste and sauté for a few sec. Add the cooked dal, turmeric powder, lemon juice, salt and 1¼ cups of water and mix well. Bring to boil and simmer for 5-7 mins, while stirring once in between. Garnish with coriander and serve hot with bhakhri and garlic chutney. Variations: Use Green Moong Dal ( Chilkewali ) instead of Yellow Split Moong Dal- Add ½ tsp finely chopped ginger, ½ tsp finely chopped garlic for tadka. 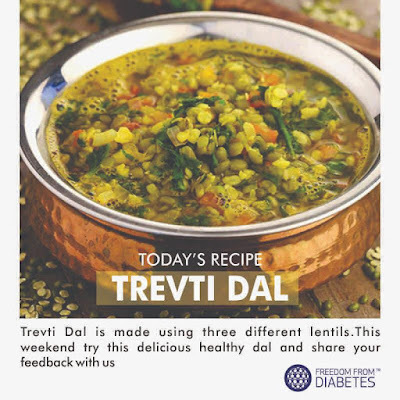 You will get another Gujarat recipe called TEEN RATNA DAL. 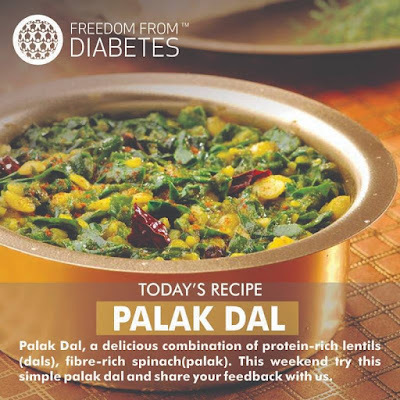 This weekend try this delicious healthy dal and share your feedback with us. धनिया से सजावट करें, एवं भाकरी और लहसुन चटनी के साथ परोंसे. Let's first understand what is Nitric oxide and and how it can be released from the body. Nitric Oxide Dump allows your body to increase nitric oxide (NO) production, since your levels of it decrease with age. NO is a type of gas that's deposited and stored in the lining of the blood vessels throughout the body and is released when needed. There are many exercises that can be used help to release nitric oxide. Here, are some exercise form done by Dr Mercola. It also serves as a great anti gravity exercise IN PLACE of STAIR CLIMBING and we've been using it extensively in the RESIDENTIAL and INTENSIVE program with very positive feedback from participants! This is a highly evolved change management program with PERSONAL ATTENTION and GROUP THERAPY. 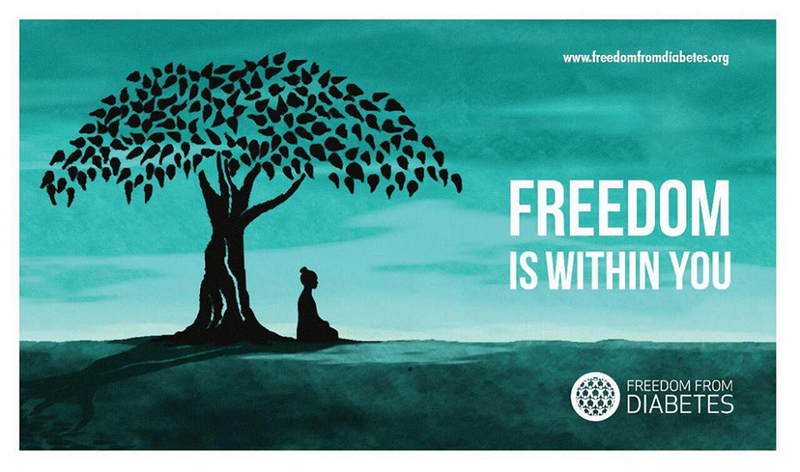 What is The Freedom From Diabetes Intensive Program? Here, in Intensive Batch 40, 19 diabetics are on stage that became free from insulin and medicines are sharing their transformational experience. Click now to view this video and get inspired. WHEN? SATURDAY 28 July. Time: 5 pm to 7 pm.Erandwane, Pune - 411 004-MADHUMEH MUKT PCMC:WHEN? THURSDAY 9 August. Time: 6:30 pm to 8:30 pm-Charges: Rs 1200/- for Diabetic/ Primary Participant. Rs 600/- for accompanying IMMEDIATE family member. 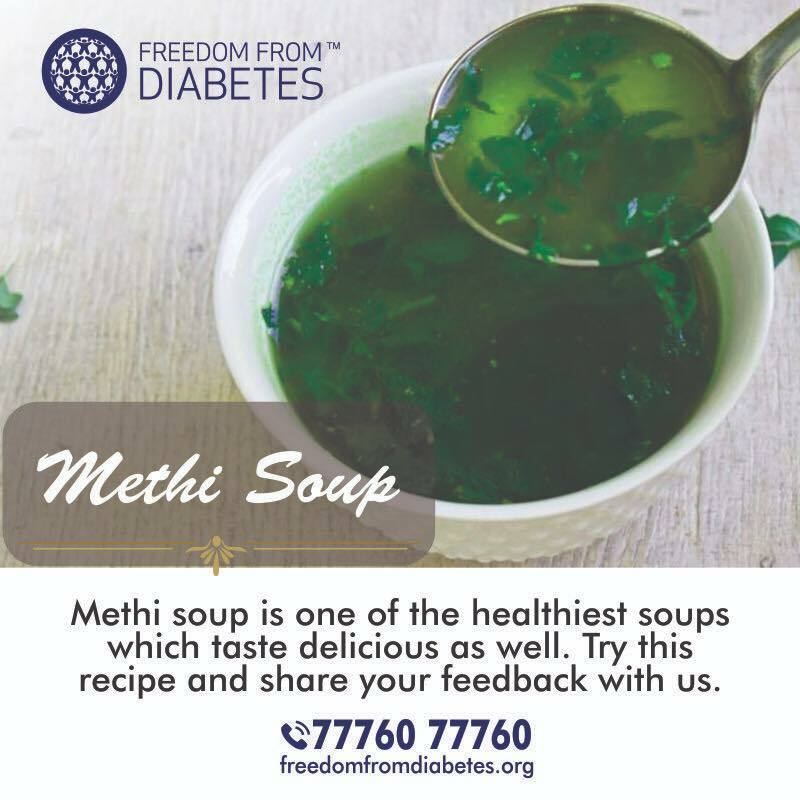 Methi soup is one of the healthiest soups which taste delicious as well. Cut finely washed methi leaves and sauté it in tadka of jeera, red chilly till it shrivels. Pour hot water in it, add salt and coriander seed powder, turmeric (optional). Squeeze lemon, let it come to a boil, cover it and switch off the gas. Leave it for infusion for an hour. Heat before serving. This is clear soup of leafy vegetables. Variations: Any other green leafy vegetable can be used. Do You Know High Blood Sugar and Insulin Will Destroy Your Eyes? Dr. Eric Berg talks about the connection between high blood sugars and insulin and how it destroys your eyes. High blood sugars and high insulin destroys your retina (diabetic retinopathy), the macula (as in diabetic macular edema) and macular degeneration. High sugar also affects the lens of the eye causing cataracts and fluids as in dry eye and glaucoma. If you are getting blurred vision, don't assume it's just "old age" and realize your blood sugars are behind so many eye and vision problems.